Farook Taufiq and LouAnn Jendro join dozens of volunteers at the Bedford Rotary Club’s Pay it Forward meal packing event at Middlesex Community College. 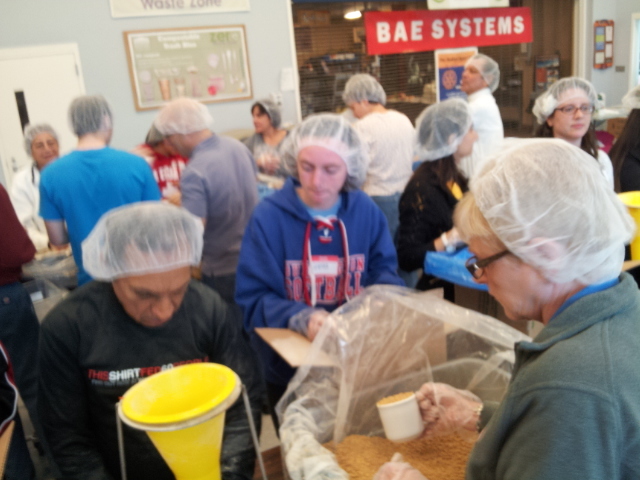 Bedford – Dracut Rotarians joined forces with area clubs in helping the Bedford Rotary Club pack 120,000 meals for Haiti as part of Bedford’s Pay It Forward project to end hunger. Middlesex Community College hosted the event at their Bedford campus on Saturday, April 26th. DRC donated $1,000 toward this Stop Hunger Now event. Helping out in Bedford was Chuck Moran, Farook Taufiq and LouAnn Jendro, along with DRC friends and family Beth Jendro Noel [Asst. Marketing Director at MCC] and Kendra Jendro. The Stop Hunger Now initiative is one that DRC member Chuck Moran is passionate about. Chuck brought the Bedford event to DRC’s attention. In fact, DRC has participated in four such events in recent months. The Club intends to host an event of its own in the near future.